Structured settlements have proven to be an effective means to conflict resolution in litigation involving physical injury and workers compensation claims. Benefits of a structured settlement to an injured claimant include flexible and guaranteed future periodic payments that are paid free of federal, state and local income taxes and can be individually tailored to meet the future life care needs of the claimant. Payment options include monthly, quarterly, semi-annual or annual payments; future guaranteed lump sum payments; and annual cost-of-living (“COLA”) adjustments. Lifetime payments may be made either with or without a guaranteed period certain during which time period payments will be made to a designated beneficiary should the claimant pass away prematurely. Joint lifetime payments for spouses are also available. However, once the future periodic payment plan is established, the future payment streams are essentially set in stone based on then-current pricing of the structured settlement annuity. Over the past 5-6 years, following the “Great Recession,” returns generated within the structured settlement annuity have fallen. Therefore, future benefit payments from the structure have, at times, been well below the levels seen prior to late 2008. Structured settlements offer injury victims strong financial security, tax advantages and guarantees. Structures are, and remain, a primary vehicle to secure the long-term needs of often catastrophically injured claimants. With the equity markets reaching all-time highs over the past few years, it can be frustrating to many that structured settlement benefits are locked in at the time of settlement, and they do not share in those market gains. This summer, Pacific Life Insurance Company introduced the Index-Linked Annuity Payment Adjustment Rider, offering injury victims the opportunity to participate in market gains without the downside risk of investing directly in the equity markets. This optional rider preserves the annuitant’s benefit levels – again without the risk that those benefit levels would ever decrease – while offering the potential for annual benefit payment increases based on positive returns in the S&P 500 index. The “Index-Linked Annuity Payment Adjustment Rider is not a security and does not participate directly in the stock market or any index, so it is not an investment. It is [an] insurance product designed to help a client prepare for his/her future” (emphasis added). Therefore, this optional rider avoids the downside risks and volatility inherent in your clients’ investing in the equity and bond markets. So, how does it work? Simply, when the S&P 500 index rises over the course of a 12 month period (referred to as an “Index Measurement Period”), the previously-designed structure benefit payment stream will also rise, subject to an annual maximum of 5%. If the S&P 500 index decreases or does not change during the Index Measurement Period, there is no change in the benefit payment amount. It should be noted that the Index Measurement Period is a one-year period beginning on the date of the first benefit payment, and is not based on a calendar year. The following graph is illustrative of a hypothetical situation in which the claimant set up monthly payments of $1500. In this hypothetical, the S&P 500 rose 3%. Therefore, on the first anniversary date, the benefit payment rose by 3% to $1545 per month. However, during the second year, the S&P 500 dropped by 4%, but the monthly payment remained the same: $1545 per month. 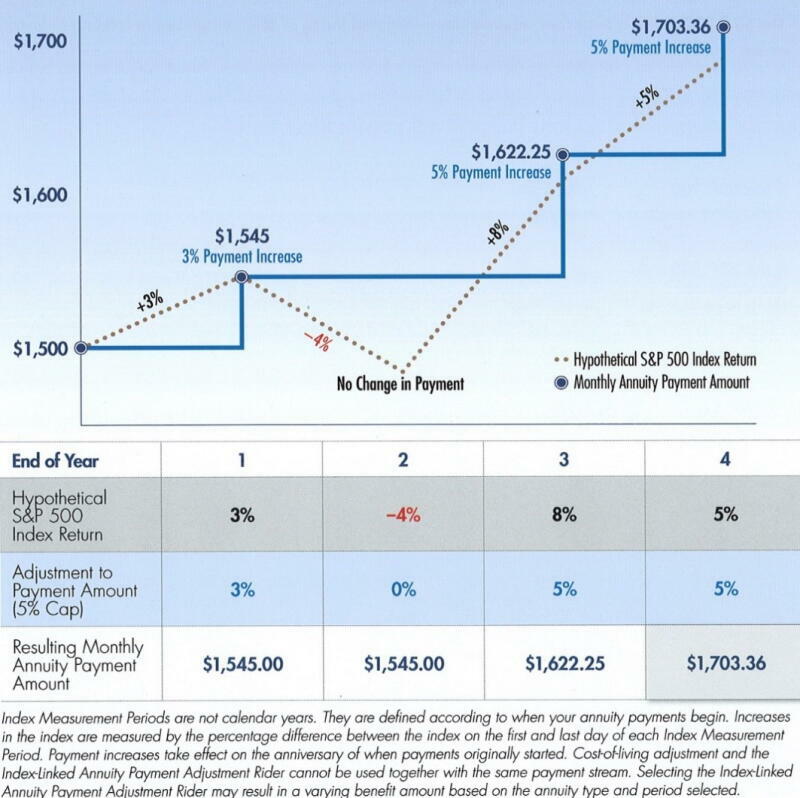 As shown below, if in the third year, the S&P 500 rose by 8%, the monthly payments increase to the 5% maximum for a monthly payment of $1,622.25. If during the fourth Index Measurement Period the S&P 500 rose by another 5%, the new monthly payment would increase to a monthly payment of $1,700.36. The Index-Linked Annuity Payment Adjustment Rider is available for use with the following traditional structured settlement benefit plans: Single Life Only; Single Life with an included Period Certain; Period Certain Only payment streams; Joint Life Only; and Joint Life with an included Period Certain. However, it cannot be used with any of the aforementioned payment plans if a COLA is likewise employed. Importantly for many attorneys preferring better returns – but less risk – is that the rider can also be used for Attorney Fee Structures. Remember the Index-Linked Annuity Payment Adjustment Rider is just that – a rider to a typical structured settlement annuity contract. Because it is not a security or an investment, quoting and setting up a structure plan utilizing the rider is as simple as with a traditional structured settlement plan. There are no additional documents required, other than the standard Settlement Agreement and Release (with the required structure language); a qualified assignment and release executed by both parties; and, if required as in minor and incompetent settlements, an Order of the appropriate Court approving the settlement (including the structured settlement plan). A further advantage of the Index-Linked Annuity Payment Adjustment Rider is that it is much cheaper for the claimant than the cost of having a 2-6% annual COLA added to the above payment plans. However the rider is not necessarily for every claimant for one main reason: with Pacific Life’s current rider, any S&P 500 index gains between contract issuance and the first benefit payment do not increase the first payment. In other words, if your client has a long deferral period until their first payment – say, 5-20 years – any gains in the S&P 500 index would not increase the first payment amount. Those payment adjustments only begin at the first anniversary date after the first benefit payment. Therefore, the rider is more suitable for claimants who have a shorter deferral period from contract issuance to their first payment. This last point is admittedly a weakness of the Index-Linked Annuity Payment Adjustment Rider, as it currently exists. Because this new structure offering is receiving widespread praise in the structured settlement marketplace despite this drawback, other life companies will most likely introduce their own index-linked payment adjustment riders within the next year or two. To effectively compete with Pacific Life’s product, those companies should strongly consider offering a product where market gains prior to the first deferred payment would positively affect that first payment. Prior to introducing the Index-Linked Annuity Payment Adjustment Rider, Pacific Life sought and obtained a Private Letter Ruling (“PLR”) from the Internal Revenue Service approving the tax-free status of any increased future periodic payments in which the rider is utilized. A copy of that PLR is available upon request. For more information on this subject, please contact Tacker LeCarpentier at Lawyers Structured Settlements by phone at (919) 247-9070 or by email at tacker@lawyersmutualnc.com. Tacker LeCarpentier is the Director, Annuities & Structured Products for Lawyers Insurance. Please contact Tacker by phone at (919) 247-9070 or by email at tacker@lawyersmutualnc.com.